FIS-B, short for Flight Information System Broadcast, is a data broadcasting service that works along with to allow aircraft operators to receive aeronautical information such as weather and airspace restrictions through a data link to the cockpit. Along with its partner system , FIS-B is available at no cost to ADS-B users as part of the FAA's Next Generation Air Transportation System (). The system gathers information through the use of ADS-B ground stations and radar and delivers that data to an aircraft's onboard cockpit display in the form of weather alerts, airport information and various other reports. FIS-B was created for use by general aviation pilots. Information for FIS-B is transmitted from ground stations to participating ADS-B In aircraft on a 978 MHz UAT data link. Aircraft that use a 1090 MHz transponder will not be eligible to receive the FIS-B product. There are currently over 500 operation ground stations that are part of the ADS-B network, and the FAA is working to add approximately 200 additional stations. The aircraft's ADS-B receiver (known as ADS-B In) interprets the data and displays it onto a screen in the cockpit. 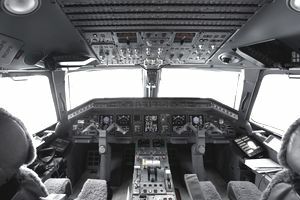 The actual interface on which FIS-B will be displayed will vary, but it will typically be incorporated into a flight management system or an electronic flight bag (EFB). Aircraft that want to receive FIS-B information must be equipped with ADS-B Out and ADS-B In equipment. ADS-B requires a -enabled GPS receiver and a transponder when one is not already included with the ASD-B unit. While TIS-B (Traffic Information Service-Broadcast) is available to both 978 MHz UAT and 1090ES transponder users, FIS-B is only broadcast to ADS-B users with a dedicated 978 MHz Universal Access Transceiver (UAT). FIS-B is not available to aircraft operators that use a 1090ES transponder for ADS-B. Operators using a 1090ES transponder will have to get their weather services and graphics from a third-party source, such as XM WX Satellite Weather. A compatible cockpit display (CDIT) is also needed to display the FIS-B data in a usable format. FIS-B is strictly an advisory service and is not meant to take the place of standard weather briefings and preflight planning. It is not a substitute for official weather sources such as air traffic control, flight service stations, NOAA or DUATS. FIS-B data link services operate in line-of-sight only. Aircraft receivers must be within the service volume of the ground station to receive FIS-B. One of the advantages for pilots using the 978 MHz UAT is that basic FIS-B services will be available to use at no cost, and these services are comparable to an XM weather subscription service. Aviation weather products such as METARs, TAFs, winds aloft and NEXRAD precipitation maps. Temporary flight restrictions (TFRs) and status updates for special use airspace (SUA). AIRMETs, SIGMETs and convective SIGMETs. Future services might include cloud top reports, lightning and turbulence information, and icing forecasts in both textual and graphical depictions. It's expected that these upgraded services will originate from a third-party and might require a subscription fee. All of the services above are updated as they become available and are transmitted every five or ten minutes, depending on the type of information. NEXRAD will be rebroadcast every 2.5 minutes.